“The mouth piece is pretty comfy, and the grips are solid. It’s the details like that that show some definite thinking went into this blowgun, for sure. … this is not only made in the U.S.A, but it’s a new business that takes an old concept like the blowgun and adds just a little extra touch or two to it. Even if blowguns aren’t your style, you’re getting a solid product with this.” Read the Full Review Here! “They are pretty awesome. When compared to Buzz Bee’s offering, they far surpass it. They are a great addition to any arsenal. It’s a unique product, it really is. 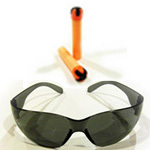 It’s simple in form, great in function, it’s compatible with any standard nerf dart. They have a great range. Fantastic product!” Watch the Full Video Review on our Media page!